Oh man. Sometimes we expect the Enterprise crewmembers to look up at the camera, break the fourth wall and just scream, "OMG AM I IN THE BEST EPISODE EVER?!" Star Trek: The Next Generation's season seven episode, Genesis, is one of those Best Episodes Ever that made us squeal and squawk with pure delight. And it just goes to show you that, for every awesome and hilarious sci-fi idea that you can possibly think of, there's probably already a Star Trek episode for it. One day, one of the Enterprise's torpedoes went shooting off into an asteroid field, irritating Lieutenant Worf (Michael Dorn) and Commander Riker (Jonathan Frakes) immensely. While Captain Picard (Patrick Stewart) and Data (Brent Spiner) took a shuttle to go retrieve it, everyone back on the Enterprise starting acting very, very bizarrely. Worf suddenly feels hot all the time, while Counsellor Troi (Marina Sirtis) starts to feel cold and parched. 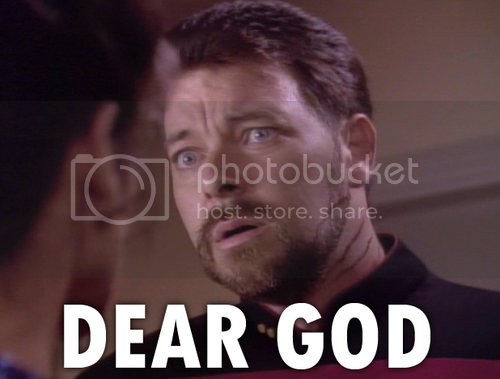 Riker can't focus on anything, and hypochondriac Lieutenant Barclay (Dwight Schulz) becomes manic. What could possibly be going on?! Is it the flu or something? Well, sort of! They're all DE-EVOLVING! Because it's the best episode of a TV show ever! Amphibian Troi. Most hilarious ever?! POSSIBLY. Pic courtesy Wikipedia. When Picard and Data return to the ship, they find it a steamy, Amazonian mess of jungle shrieks and predatory roars (that would be Worf, who de-evolves into the Shrike - shout out to Dan Simmons!). 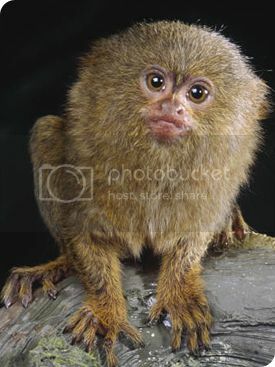 Picard immediately contracts the virus, and it's only another twelve hours before - according to Data - he will de-evolve "into either a lemur or a pygmy marmoset." 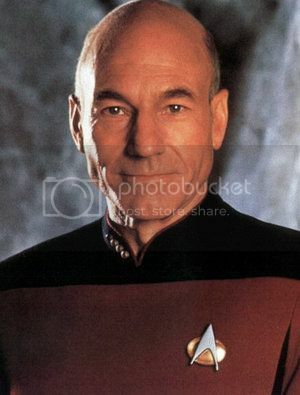 Of course, leave it to Picard to become the most squirrelly and adorable of primates - while beefy, seven-foot Riker turns into a Neanderthal (okay, australopithecine). 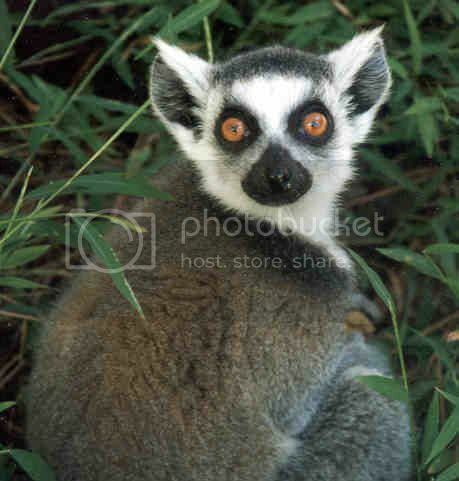 While he goes all anxious and twitchy (and kudos to Patrick Stewart's Royal Shakespearean training - who else could so fully encapsulate Terrified Lemur Man? With such pathos? 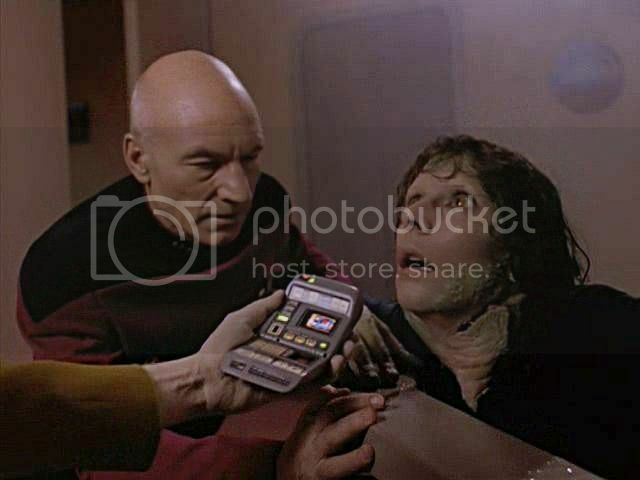 ), Data saves the ship. Again. Ahh, this was the best of a very strange show. We've been overdosing on Next Generation for the past few days, ever since discovering WatchTrek.com, and we've often found episodes so overstuffed with insane ideas that the audience (or characters, for that matter) has no time to fully digest what the hell just happened. Soul-sucking aliens from another dimension… your accidentally-created double wooing your ex using tai chi-inspired interpretative dance… finding out someone amputated your arm and reattached it while you were sleeping?!! It's all in a couple episodes' work for Commander Riker, for example. And that's just one character! The show is packed with this sort of stuff. We love it. 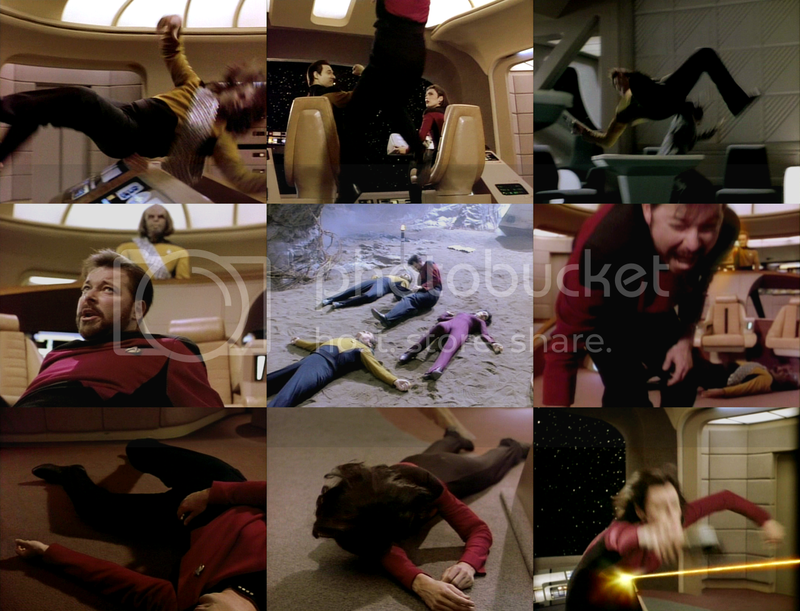 A gratuitous shot of a typical TNG episode, wherein everyone is jumping around and falling over. Pic courtesy FYTNG. We loved this episode because it captured that atmosphere of bizarreness, hilarity and horror - an intoxicating cocktail, and not something that's easy to do. When Picard and Data run into their former crewmates who are, one by one, presented as a gaping amphibian, a roaring australopithecine, and, well, the Shrike - it's hilarious, weird, and scary. It's like Slither, or The Fly, or the Evil Dead series. That is, sort of disgusting - but in a really awesome way. And the cat-lizard! THE CAT-LIZARD!? Buy this now. Buy it.